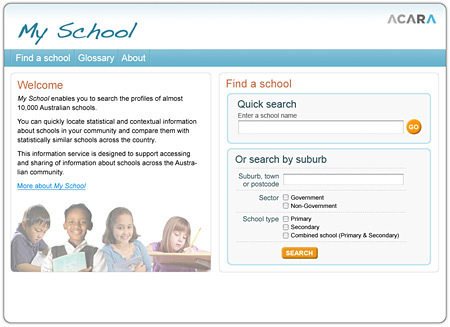 There has been a lot of media commotion surrounding the launch of the new Australian Government’s MySchool.edu.au website. detailed information about all the schools in Australia. It uses a new index of student and school characteristics, developed specifically for the purpose of identifying schools serving similar student populations. This enables schools’ results on national tests to be understood in a fair and meaningful way, and enables schools seeking to improve their performance to learn from other schools with statistically similar populations. Which ends up being one extremely large detailed database with enough information to be used for both good and evil purposes. The newspapers latched on to the ‘use of data for evil’ aspects within hours of the sites release. Comparing schools in a way that highlighted the absolute top and the absolute bottom. It made me think, as a computer scientist at true heart, given any data set what are are primal instincts. Naturally we want to find the fastest, highest, best of the data and conversely the slowest, lowest and worst of the data. Average / median may just be a novelty we do to figure out where the juicy part of the bell curve sits. So with the new site, can you really blame people for using the data as a comparitive mechanism to work out the best and worst of? Remembering all data outputs need to be taken with a grain of salt, there should be little fear that the results of many judge the results of a few or vice versa. We are only talking statistical averages here and no data set could tell us of the bright intellectual working hard in a school without other students sharing the same passion. Take the new website as just that, a grain of salt. Have some fun with it, but don’t get too serious with the data that can be output with it. Data is in its rawest form has no meaning, until you process it and give it meaning, in which case it becomes information. Don’t let your own generated information cloud your judgement. On the SEO side of things, given its just a newly released site, Google has not yet had a chance to reindex the page and is still displaying the old meta title and description. They could have created a better Title tag, perhaps something referencing it is a government website to give it more credibility. The new TITLE tag: <title> Find a school | ACARA</title> Means little to nothing, gives no indication of what you can actually do on the site and having an unexplained acronym (ACARA) is poor form. Ok, grant it the site got 1.7 million hits in its first morning, SEO probably isn’t the most important need for this site while there is still buzz surrounding it. But in the future it could surely benefit from being found easily by search engines by users with no prior knowledge of the site.